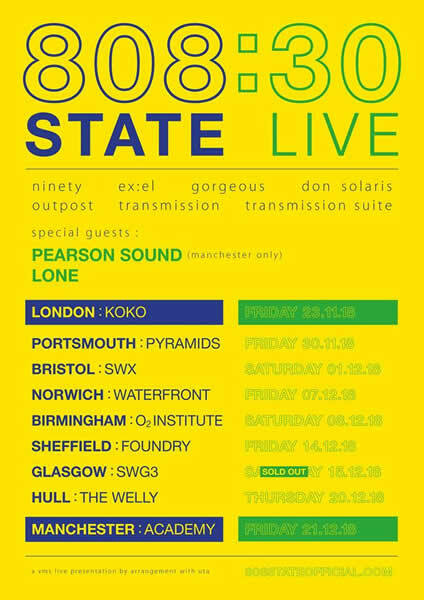 808 State UK live tour Nov/Dec 2018 announced! Re: 808 State UK live tour Nov/Dec 2018 announced! No way.... Its way past April 1st! This is most exciting news. A wee night out in the Big G.
All the old heads coming back to the board, nice. I'll try to make London. Hope to make London and maybe Glasgow. Love a home town gig, but it's too close to Christmas. Ticket booked for Glasgow. Hope to see some of you, there. So, the venue for 808's gig in December suffered majorly from the fire at the art school, next-door. Graham, have you had any word as to what is happening? "Very sad news that O2 ABC Glasgow has been damaged by the fire at The Glasgow School of Art on Saturday night. Unfortunately our show on December 15th will no longer happen at ABC, but we are working to find an alternative and will be in touch with more information ASAP"
I still haven't worked out which gigs I'll be doing yet in November/December - depends on where I'm working and whether I've got lots of annual leave left! Glasgow: Our show on Saturday 15th December with LONE has moved to SWG3, due to the fire damage at O2 ABC Glasgow. Are we getting any previews of the new material? Exciting times with 808, Orbital, The Prodigy and The Chemical Brothers all working on new stuff!